Please allow 3-5 business days to assemble kits. New OEM Proximity Keyless Entry Receiver Premium package. Kit 10 is for those who don't currently have Remote Start, but want it now. 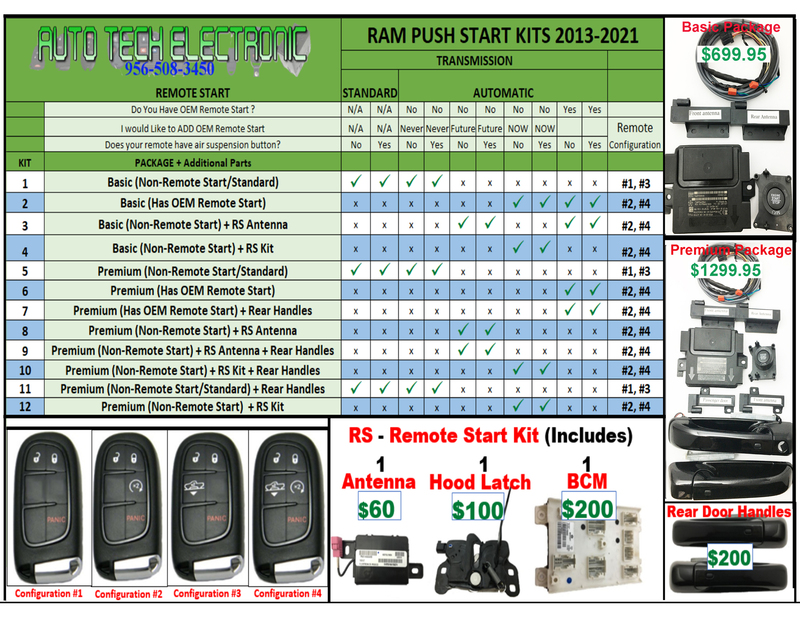 This package comes complete with our Remote start Kit (includes 1 Antenna, 1 Hood Latch, and 1 BCM). Front and Rear door handles are also included. If your RAM Truck uses the Fobik Remote Key that you have to insert into the Ignition Switch and want to upgrade to the Proximity Push Start System found only in the Expensive packages to RAM Trucks, then this kit is for you! This is an entry level Kit with the Front door Handles to Enter the Truck. Just use New Remote to unlock the doors, enter vehicle, press the brake pedal and Push the Start button and Go. Keep the remote in your pocket. We configure your existing BCM with the features needed in this kit. Truck MUST HAVE AUTOMATIC Transmission to install Remote Start included in this kit. Please refer to our chart to view our available kits and find the most suitable kit for your vehicle. Find all our Installation files/media here. * Does your vehicle have Memory Seats? this purchased really blew my mind it was one of the best purchase and the friendly staff and the techs really helped a lot thank you so much for making this transition as smooth as possible.